Tickets: $28 GA; $100 VIP; Kids Under 12 Free! Hailing from Baltimore, The Dirty Grass Players have established themselves with one toe-tappin’ foot in traditional bluegrass and blazing musicianship that pushes boundaries. 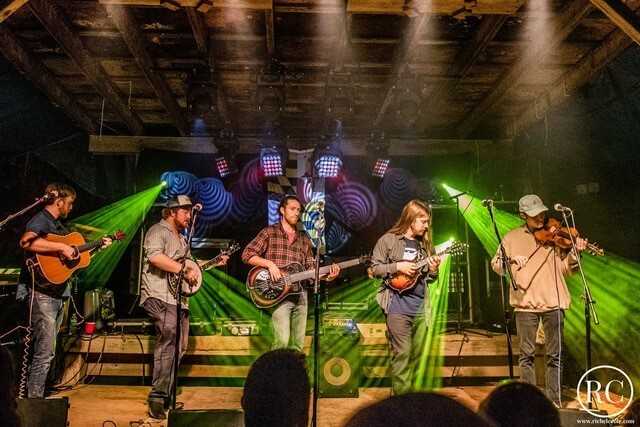 Comprised of Josh Ballard on Bass, Alex Berman on Banjo, fiddler Crosby Cofod, Ben Kolakowski with the guitar, and Ryan Rogers on mandolin, this five piece is successfully bringing their growing fan base a down, dirty, and heated performance. Their ability to seamlessly transition from downhome bluegrass to spirited improvisation makes each performance unique. Throw in some Allman Brothers, Pink Floyd or a dash of Southern Rock, and you’ll quickly understand what they mean by Dirty Grass. Their self-titled debut CD, “The Dirty Grass Players” captures this energy, and as 2017 winner of Charm City Bluegrass & Folk Festival Band Competition clearly indicates, this is just the beginning. Successfully touring the Mid-Atlantic and festival appearances, 2019 finds the group expanding along the East Coast and building on this momentum. For anyone that enjoys a musical throwdown by skilled musicians, it’s time to get your grass dirty. Learn more and sample their sound on Facebook or at www.thedirtygrassplayers.com. Wicked Sycamore is the all-female acoustic trio comprised of Madeline Waters, Lainie Gray, and Juliette Bell. Hailing from the DC/Baltimore area, Wicked Sycamore can be described as contemporary folk with a mischievous edge. Grounded in traditional and roots music, they branch out into jazz, blues, Americana, soul, funk, folk, rock, bluegrass, pop, and more. With original music ranging from fun and light-hearted sing-alongs to deep, introspective melodic tunes for the ages, their music relies heavily on thoughtful arrangement, instrumental prowess, and intricate vocal harmonies—no matter the genre. Each member of the band is a multi-instrumentalist who brings a unique background and influence to their sound, highlighting their musicality and progressive songwriting—proving that good things do indeed come in threes. Check out selections from their debut CD, “Growing Roots” on Facebook or at www.wickedsycamore.com. Get full Concert information here!